This Halloween we asked Charlie Fletcher to write about what the festival of all things ghastly and ghoulish means to him. 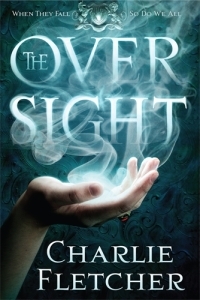 Charlie’s supernatural fantasy novel, THE OVERSIGHT, comes out in paperback next week, with its sequel, THE PARADOX to follow next summer. I like Halloween, for two reasons. The first has to do with being a dad, the second is a writer thing. When our kids were toddlers we lived in Los Angeles, where Halloween was a suitably big and authentic deal, the full American trick-or-treat experience, with pumpkin-carving parties (not to brag, but I’m kind of a big deal when it comes to carving a wicked Jack o’ Lantern), cool and unusual costumes and enough candy and e-numbers to stun a Clydesdale. My favorite costume ever was at a house in the Palisades: our four year old (suitably dressed as a furry bat) knocked on the door, which swung open to reveal a man sitting at a solitary table in the hallway, apparently eating his supper. He seemed the nicest Norman Rockwellish old geezer and he beckoned us to come in and choose some candy from under the domed silver dish cover in the centre of the table. When the cover was lifted it revealed neither candy-corn nor Tootsie Rolls, but a woman’s head on a bed of lettuce. A beat of silence followed. It was a very realistic head, eyes closed, dead as mutton. And then the eyes opened and it spoke to our kid. Screams, shock and finally hilarity ensued. I loved, and still love the fact that this couple built a table with a hole in the middle, and that the wife spent all evening lying in wait for the unsuspecting trick-or-treaters to scare the pants off them. And that’s the second thing I like about Halloween. The dark. More specifically being in the dark. Trick or treating in LA was fun, but in truth it was more Frank Capra than John Carpenter when it came to scary. It was Americana of most enjoyable kind, but there were no true chills. And there should be a shiver and a frisson at Halloween. It’s the start of the Dark Half of the year after all (Winter has come . . .), Allhallowtide is upon us, as is Samhain, the time when the border between us and “them” – the dead and the uncanny – thins and becomes scarily permeable. And that’s what you feel in the dark. Less rational, unmoored from the certainty of daylight. 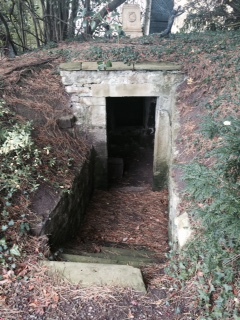 Crouching under ground, in the blackness, waiting to scare the children, I too felt the chill of the shadows behind me. It’s a good thing to do, every now and then, to let yourself be that guttering candle in the surrounding dark. There are good things there as well as bad, same as in daylight: I’ve walked alone in a deserted glen far down Loch Etive and definitely felt watched by something not entirely well disposed to me as I passed through the ruins of a tiny hamlet abandoned in the Clearances. And that was in bright noon-day sun. In The Oversight the Sluagh inhabit that unlit space; they stalk the book as Shadowgangers and Nightwalkers, and they certainly came out of the darkness into my head. As to whether they are evil – as some readers have asserted – time (and The Paradox) will begin to tell. What they certainly are is ‘other’. And though they are not quite the same as the Celtic fairy host of the undead sinners that share their name, they do of course owe a big debt to them. One of the reasons I avoid the F-word in my books is it has become too overlaid with ‘cute’ and winsome (for which we can start by blaming the Victorians, as with so much, and then proceed to Disney and the Dreaded Pink Aisle in Toys’r’Us). But as someone who spent way too much of his third year at university reading about the Fairy faith in Celtic cultures I do like the muscular fear and healthy wariness about the unseen and what might lurk there that used to fill people’s heads. Not because I think people should be scared all the time, but that in thinking about the dark they can exorcise those fears a bit and realize they too are a candle against it. And then again. Halloween is the traditional day of the year when those older Sluagh ride. So watch out when someone knocks on the door tonight. It could be a sugar-crazed toddler in a furry bat-suit. Or it might be the darkness calling . . .